Product code: T551 Categories: Sold Items, Sold Jewellery. Cartier have always been known for quality and craftsmanship, and here are a very attractive and stylish pair of 18ct Cartier cufflinks dating from the 1980’s. 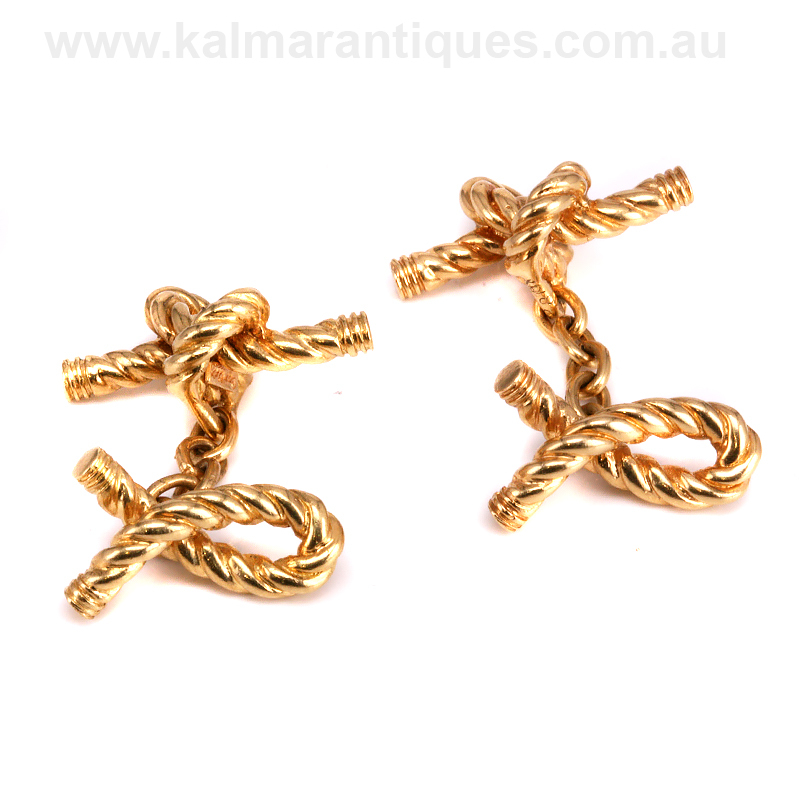 These wonderful cufflinks are in the form of rope twisted into knots with the longest one measuring 19mm across and the shorter one 16.5mm. 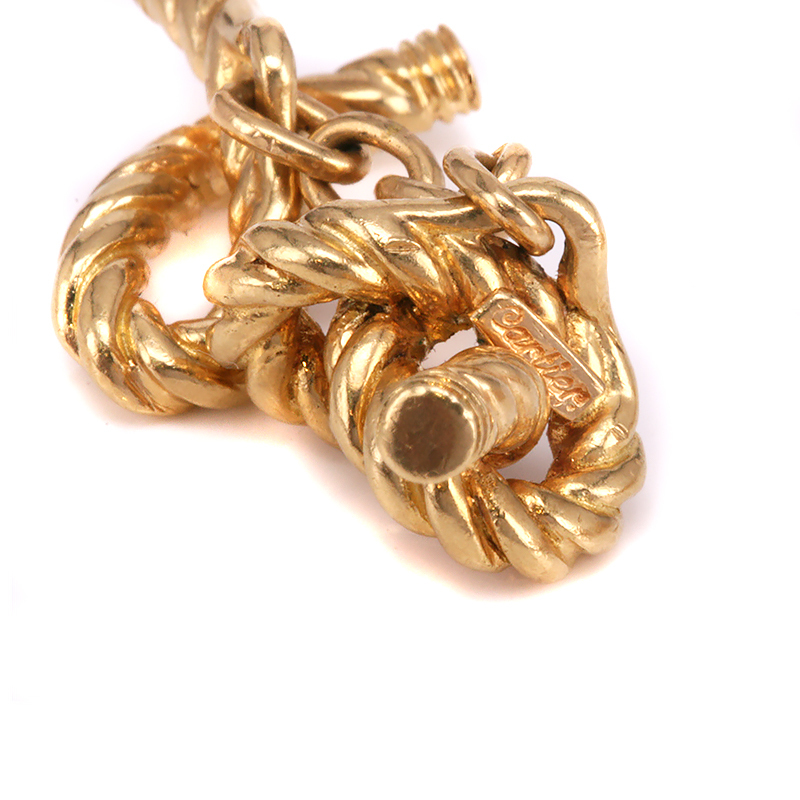 Connected by very secure and strong 18ct yellow gold links, these Cartier cufflinks will finish any suit perfectly and there is nothing quite like cufflinks for the elegance and style that they portray. Perfect for any occasion, these lovely solid gold Cartier cufflinks are sure to always be admired and appreciated. 18ct Cartier cufflinks. The history of cufflinks goes as far back to the 1600’s however they were more common from the mid-1700’s. Reaching a peak during the Edwardian and Art Deco period of the early 1900’s to the 1940’s, in recent years cufflinks have made a hge comeback for both men and woman alike. Perfect in finishing off an outfit, there is nothing like a French cuff with a gorgeous pair of cufflinks to wear proudly at the wrist. Cartier was founded in 1847 by Louis-François Cartier, where he quickly established a name for himself and his company as a retailer of high end and very fine quality jewellery and watches. Cartier made pieces for such people as Edward VII and Bhupinder Singh the Maharaja of Patiala. Even today Cartier is known the world over for the quality and craftsmanship, and these 18ct gold Cartier cufflinks show what wonderful pieces have been created over the years.